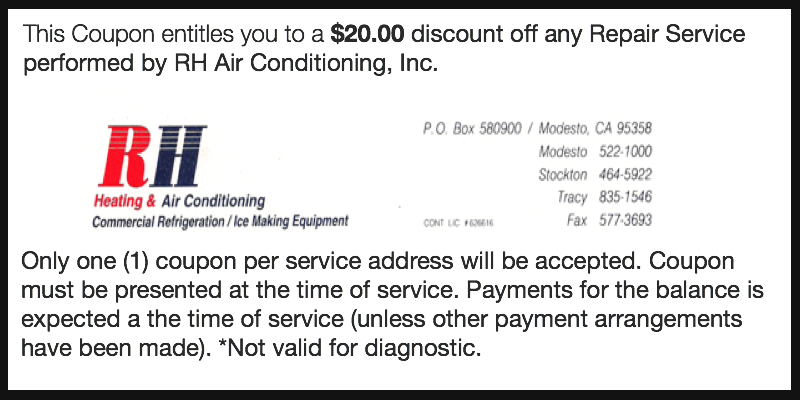 Coupons | RH Air Conditioning Services, Inc. Receive a $40.00 Discount With a Yelp Review! Simply follow this link www.yelp.com/biz/rh-air-conditioning-inc-modesto and write a review for our company detailing your experiences or how we solve your problem. Print the review, hand it to our service technician, and you will receive an instant credit for $40.00 off ANY Diagnostic, Repair Service, or New Installation!